Disclosure: This is a compensated post with Hinode for Whole Grain Month, National Rice Month, and celebrating rice harvest. Thank you, Hinode, for making NJB awesomeness possible! As usual all opinions are my own. 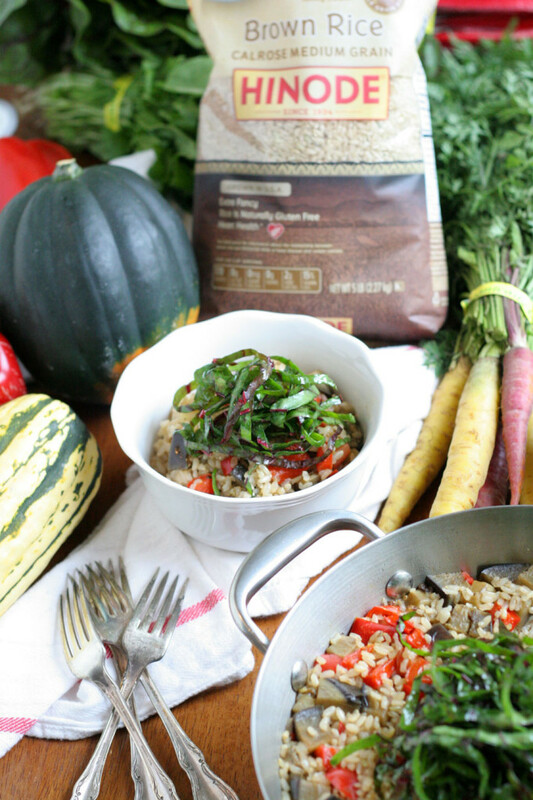 I am super excited to share this delicious one pan meal full of whole grain goodness, local amazing Autumn produce, and charity to boot! 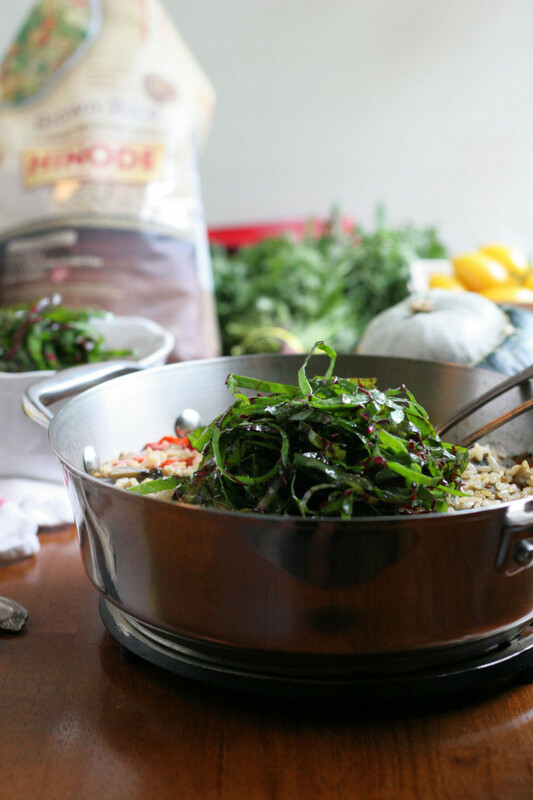 I am working with a whole grain calrose medium grain Hinode rice for this beautiful, hearty, nutritious meal. It makes my job so much easier to work with these amazing companies, that do amazing things for our communities. 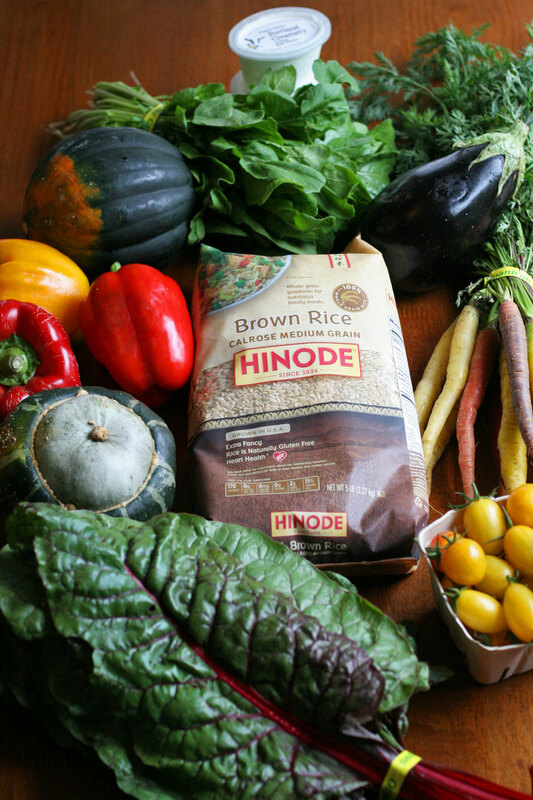 Hinode will be donating pound for pound for every bag of Hinode rice that is purchased at the following stores on Friday September 26th, Saturday 27th, and Sunday 28th. Below is a list of the exact locations that are taking the donations on each day. All of the proceeds will go directly to the Oregon Food Bank, which is just in time for colder weather and the holiday season. You can also get a coupon on the Hinode Facebook page, to help with the purchasing of the rice. Thank you for your consideration, and generosity. Sunday: 3pm – 5pm Albertsons Lake Grove 16199 Southwest BNS Ferry Rd. On to some interesting facts about the nutritional value found in a whole grain brown rice. Did you know that brown rice is a 100% whole grain and naturally contains vitamins and nutrients including Iron 4% Daily Value, Fiber 6% Daily Value, Niacin 10% Daily Value, Thiamin 10% Daily Value, Magnesium 15% Daily Value? These are key parts of our daily needs that are so easy to get from one cup of brown rice. Eat two bowls in a day and you are almost at the daily serving for whole grains. Brown rice is so good, I have been incorporating it more in my diet for breakfast, lunch, and dinner. Add vegetables and goat cheese to make an already good bowl of rice taste even better and make a meal out of it. It is easy, quick, and no fuss, nutritious eating. What more could we want? You can certainly add your favorite vegetables to this dish to change it up for a warm weeknight meal, or busy weekend schedule. The other crazy awesome thing? Hinode carries a microwavable small serving that can be added to this dish for the quickest meal ever. Now we have no excuses right! I had the pleasure of going to the Shemanski Park Farmers Market in Portland to get all of the fresh local in season produce. I had plans of using sweetpotatoes, Brussels, and peppers. I ended up buying eggplant squash, carrots, peppers, chard, arugula, tomatoes and goat cheese. This is the perfect example of going with the flow with what is available at the market, and that is what I love about this dish. 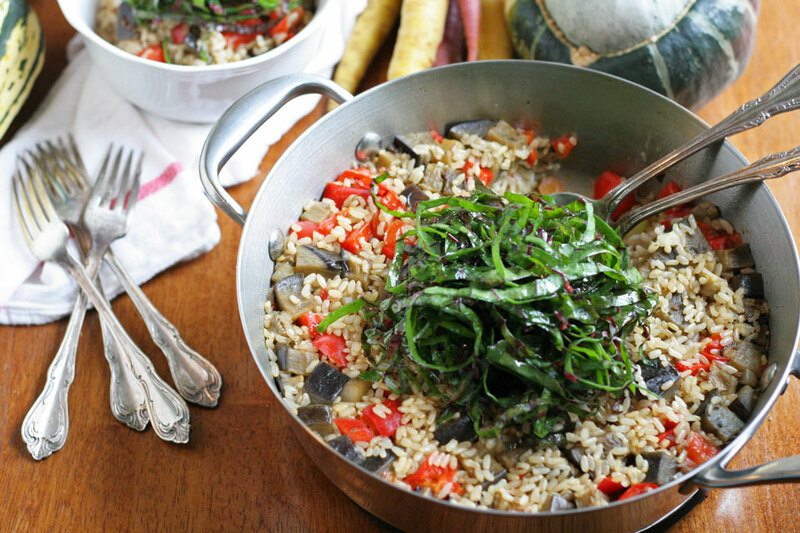 You can add any chopped up vegetables all year round for a good meal in this Brown Rice with Vegetables and Goat Cheese. You can watch my TV segment live on ABC’S KATU AM Northwest here! You could also add chicken apple sausage, dried chorizo, or chicken for more protein. 1. Using a 10 inch pan add olive oil over medium low heat, when oil is shimmering, add rice, cook for 2-3 minutes. Add stock, salt, ½ teaspoon pepper, and vegetables. Cover and cook for 40-50 minutes. 2. Turn stove off, stir in goat cheese using a spatula, taste for seasoning. Serve in a bowl topped with a handful of greens, and more goat cheese optional. What a lovely and healthy meal. I love brown rice and it looks like I need to try this brand!! I’m adding this to my must-try soon list! So delicious!